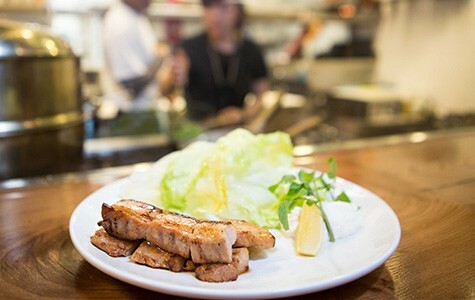 The pork misozuke, marinated pork belly, was grilled to perfection. Hours: Mon.–Sat. 11:30 a.m.–2 p.m., Mon.–Thu. 5–9:30 p.m., Fri.–Sat. 5–10 p.m. Some things get lost in translation. How else to explain why otherwise food-savvy Americans have gotten the idea that the izakaya, or Japanese pub, is meant to serve tiny plates of food for sky-high prices? 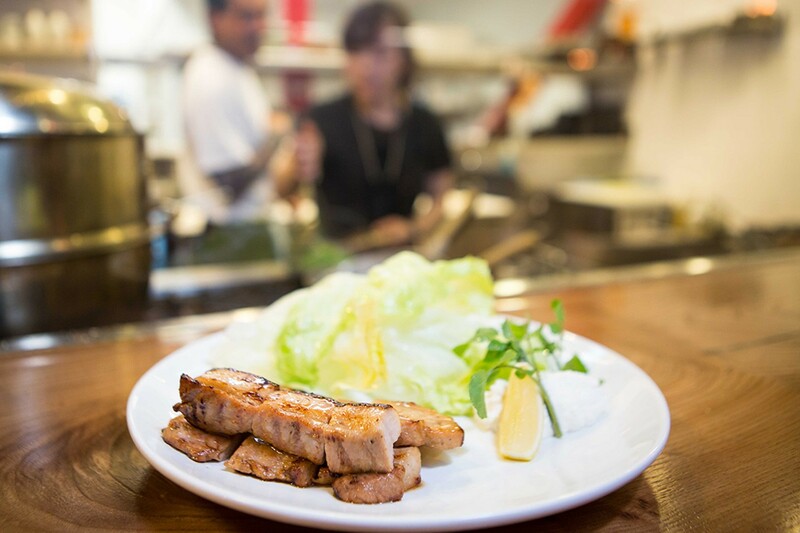 The original B-Dama on Piedmont Avenue was the rare izakaya that hewed relatively close to the working-class Japanese ideal, compared to your typical Bay Area slinger of overpriced yakitori skewers. Chef Chikara Ono would serve these suave little dishes meant to be scarfed down while customers lingered over cups of sake and Japanese beer, but with none of the pomp and circumstance — and the associated sticker shock — that usually accompanies this style of food in the United States. Before it closed this summer, it was my favorite Japanese restaurant in Oakland. If anything, AS B-Dama, the new order-at-the-counter incarnation of the restaurant at Swan's Market, improves on almost everything I loved about the original. The setting is even more low-key and accessible. The prices are just as affordable. And the food is more soulful and audacious than ever. 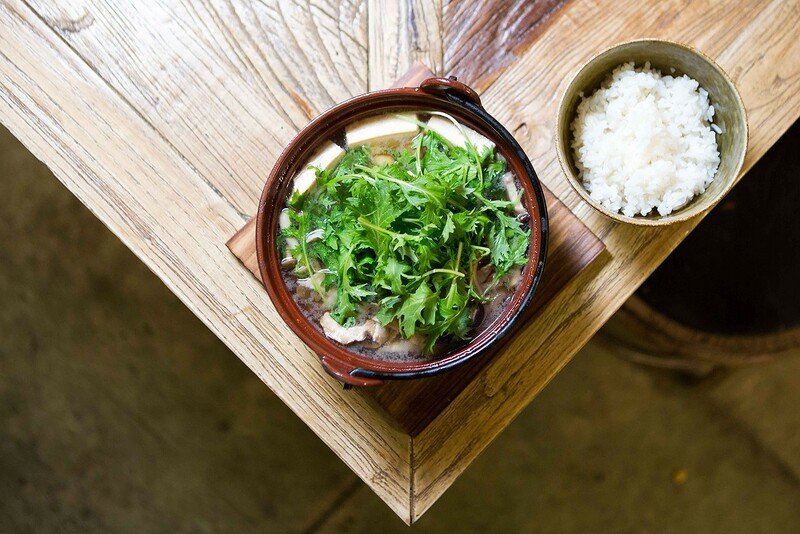 When the weather is as damp and windy as it has been lately, you'll want to order whatever nabemono (Japanese hot pot) happens to be on the menu. 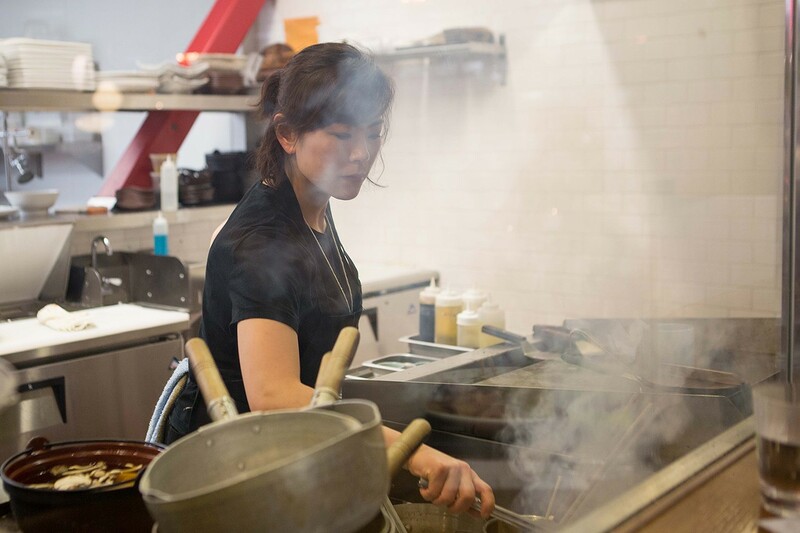 Even on a warm evening, the hari hari nabe was deeply comforting — a wholesome miso-based broth filled with treasures: thinly sliced pork belly, rice noodles, straw mushrooms, tofu, and the distinctly herbacious Asian green known as mizuna. Although dishes like this can be broadly categorized as Japanese comfort food, AS B-Dama is also notable for its creativity. Take the agedashi tomato, for which plump cherry tomatoes were dredged in potato starch, deep-fried, and arranged prettily in a long wooden vessel filled with hot dashi broth. Bonito flakes wavered back and forth on top as though electrified. So many layers of flavor in every bite: smokiness, umami, and a burst of hot tomato juice. I was also partial to the gyu suji nikomi, in which thin slices of beef tendon simmered in a sweet-and-savory sauce until they'd relaxed into a soft, tender mass. The stew was topped with a pile of Korean chili threads, whose fruity heat helped offset the sweetness. Order this with a big bowl of white rice; few things are more comforting. And the karaage (Japanese fried chicken) was notable for its use of the whole chicken — bone-in wings and breast pieces in addition to the usual thighs. Eating the hot, juicy morsels with a lemon wedge and a dish of curry powder for dipping is pure pleasure. And for $7, there isn't a Japanese restaurant in town that serves a more generous portion. If the dinner menu at B-Dama showcases the kitchen's creativity, lunchtime is all about comfort food — the kind of simple dishes that Japanese home cooks serve to their families. In the pantheon of Japanese noodles, the humble udon — thick, chewy, and utilitarian — will never compete with ramen in terms of sheer sexiness. And yet B-Dama's udon soup was probably my favorite dish from a recent lunch visit. The broth was as soul-warming as you'd expect from something made by simmering kombu (dried kelp), dried fish, chicken, and assorted vegetables; the noodles were a slippery, eminently slurpable delight. But the solo lunch diner will be hard-pressed to pass up on the teishoku, or daily set meal, which usually offers a choice of either meat or fish, and the kind of variety you'd normally only get when ordering multiple dishes. The salmon teishoku ($12) came with a beautifully grilled piece of teriyaki-glazed fish, pickled daikon radish, rice, miso soup, and — the icing on the cake — a pile of excellent, shatteringly crisp-battered tempura-fried vegetables. There were no throwaway sides. Of all the dishes I tried, only the tsukune, or chicken meatball, rice plate was less than stellar. As much as I loved the runny-yolked onsen egg on top, it couldn't make up for the blandness of the meatballs themselves. AS B-Dama is less sushi-focused than the old B-Dama, and its sister restaurant Geta, which is run by Ono's brother. But one welcome addition is the gaburi sushi — large, uncut rolls that are meant to be eaten on the go. A version filled with crabmeat and avocado makes for a filling snack, and was portable enough for me to contemplate eating it one-handed in the car. All of this, and I haven't talked yet about how pleasant it is these days to eat at Swan's Market. Indeed, I'd argue that Oakland's most exciting dining destination right now isn't Uptown or Temescal, but rather this marketplace-turned-casual-dining epicenter in the heart of Old Oakland. It's like a food court— except all of the food is delicious, and the restaurants are housed in one of Oakland's great historical landmarks. On a recent Saturday night, the place was hopping, and you could spot some of the city's prominent chefs serving food in a more intimate way than at most stand-alone restaurants — Cosecha's Dominica Rice sliding over a plate of shrimp tacos, Romney Steele of The Cook and Her Farmer shucking oysters. "Everyone is busy," Ono later told me. He was there too, of course, wearing his trademark bandana, embracing his new jack-of-all-trades role — taking orders and hustling dishes over to customers. 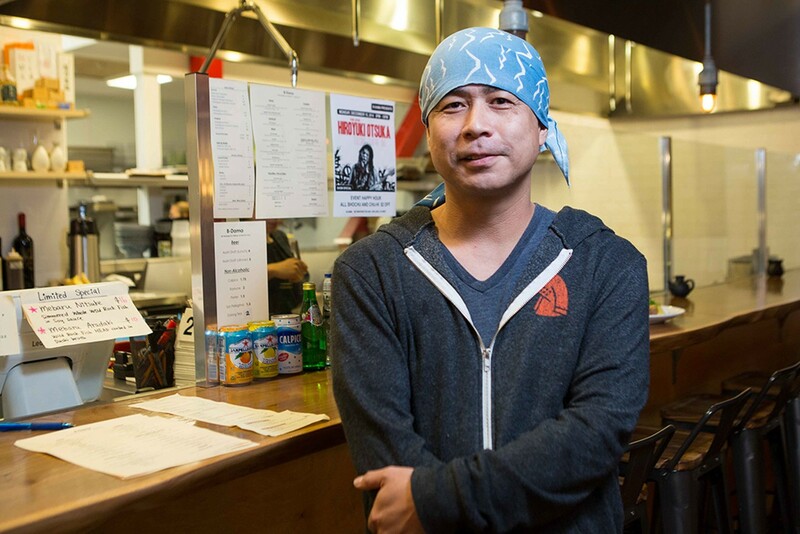 He's quick to give all of the credit to his protégés, Asuka Nadeshiko and Shin Okamoto, the young chefs whose first initials grace the name of the restaurant and who have created most of the menu. These days, Ono only occasionally gets in the kitchen, usually to work some kind of magic with raw fish. Trust me, though: Those dishes will be worth ordering.